Contexts for writing keep changing, and Andrea Lunsford knows that every writer needs to engage with audiences and communicate ideas every day. The Everyday Writer with Exercises shows novice writers how to navigate rhetorical situations and make effective choices everywhere they write. The illustrations, by Eisner Award nominee GB Tran, offer a high-interest approach to writing processes and encourage students to open and use their handbook. And Andrea’s friendly voice is always front and center, ready to answer any question. 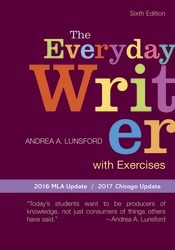 With new and expanded coverage of presentations and multimodal projects, integrated advice for writers from all language and educational backgrounds, and help learning the moves that make expert writers credible, The Everyday Writer with Exercises is the encouraging guide students need to take their writing to the next level.